We are proud to present you with the best collection of Halloween wall art prints you will ever be able to find. One of the most mysterious holidays of the year, Halloween is still fun and enjoyable by adults and children alike. The Halloween wall art prints we have gathered here are meant to bring even more Halloween mood to your home and family and, thus, make it even more fun. Witches, ghosts and other paranormal beings can decorate your home and make it a true Halloween lair with our Halloween wall art pieces. You may hang them anywhere you want – bedroom, hallway, children’s room, living room, kitchen and they will look radical. Our Halloween wall art prints range from paintings reproductions to pinups to photographs – a lot of artwork types to meet any needs of our clients during this time of the year. Some of the Halloween wall art prints at our store will fit better in children’s rooms, while others can be placed in any other room of your home and become a very good decor piece, while being a great Halloween-themed piece. You only have to spend a few minutes to look through the options available in our gallery and find your best Halloween wall art print for the best price. 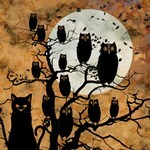 Once you have chosen the Halloween wall art print for your needs, we will take care of it for you from there. We provide the best prices and service on the art prints market, so you may rest assured that you’ll get the best print in no time right to your door.